Scott Weingart. EMCrit Podcast 15 – the Severe Asthmatic. EMCrit Blog. Published on December 8, 2009. Accessed on April 23rd 2019. Available at [https://emcrit.org/emcrit/severe-asthmatic/ ]. I like your comments on “To PEEP or not to PEEP, that is the question…” and the difference between peak pressure (what the airway ‘sees’) and plateau pressure (what the alveoli ‘see’ – and what makes them ‘pop’). 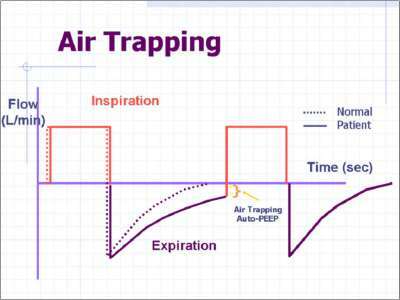 An ‘expiratory pause’ can also be used of course to quantitate autoPEEP. I don’t see as much severe asthma in Australia as back in New Zealand – but IV salbutamol is widely used (esp in NZ) with great anecdotal success ( prior to NIV). Do you use the IV route much in the US? Unfortunately, it is not available in the US. Only choices for IV meds would be epinephrine or terbutaline. Thanks for the comments. As usual, another great job. In the asthmatic population that appears to “failing” NIV with continuous B-agonists (or at least not turning around as quickly you would like) what are your thoughts on IV epinephrine. If you do believe it plays a role in the critical asthma patient what would be your recommendation on dosage? I’ve heard it toted as a viable treatment option by Dr. Herbert from LAC+USC in this situation. Would you use a similar “mix” as you mentioned in you bolus-able pressors talk (1ml of 1:10,000 epi mixed with an additional 9ml of NS)? I’d probably start with IM dose 0.3 – 0.5 mg 1:1000 as it has the longest track record for use in these patients. If you were to give it IV the 5-20 mcg/5 minutes dose we use for bolus dose pressors would probably work well. You mention NIPPV prior to intubation. What settings would you suggest? Also, surely this drug is rate dependent not dose. You just have to see the vasodilation! Wouldnt jump to say it doent work off of a self fulfilling prophecy. Need to compare stat dose. there is lit on improvement with CPAP but not as impressive as IPAP. I’d probably stick with regular neb masks in that situation.